For the final, I decided to make a very low-tech game board for wood lathed tops to spin on. My experience using the wood lathe this semester has been incredible thus far and I very much so have enjoyed learning the process with different types of woods. One morning I woke up and decided that I would make a top. I chose to make this out of Poplar wood because I wanted to see how poplar turned and wanted to make something that I could fidget with that was not plastic. I also liked the natural greens that were in the wood and thought I’d try it out. When I was turning the top I didn’t try to shape it too much or add too many details. It was my first time turning with Poplar and I wanted to get a hang of it, as I bought a bit of wood for the future to use. A big lesson I learned immediately was that the turning process is a bit tricky towards the end when creating the tip for it to spin on. With the poplar top, I decided to hand-sand the bottom to perfect the tip for a good spin and then had to clean up and run to class. During class I kept playing with the top and wondered other woods would feel like. After class, I turned an additional two tops that evening — both made out of oak. These were more detailed and a bit unique in their own way. Oak was a bit more difficult to turn as it chips quite a bit, but I managed to get these two on the same piece at once. Again, turning the tips managed to be a challenge so I hand sanded them as well. At this moment, I decided I wanted to do a series of tops for the final project. I had a bit of walnut still left from my mallet project and quickly spun up two tops — one larger and smaller than before. For good measure and practice, I also made another oak top. The tips are the vain of my existence at this point yet I use the sander with a gig and get some interesting results - there is no tip on the big walnut, a very pointy tip on the small walnut, and burned marks on the oak. A mix for sure, but each unique in their own way. I initially wanted to use this beautiful piece of Norwegian Walnut I found at the Big Reuse in Brooklyn but realized that it would not work on the 4 Axis (because of size) and then didn’t want to entangle myself with the CNC while the other class was building out their finals. I asked John for advice and he suggested a mallet and chisel approach. I had some time so decided to play it out and see what came out of it. I’m just going to say this now. I have so so so much respect for wood workers. This was grueling, yet rewarding. I started out with the drill press drilling some holes to help with the process. This took its toll quickly and I was eager to begin. I decided to drill holders for all the tops at the side and made a presentation sign out of walnut and the laser cutter to display my work. I think I spent roughly 8 hours on this thing. But I love every bit of bump and groove that it has to offer. The chisels were dull and awful but I did it. I made it happen!! Next came finishing. I love the beeswax I got for the mallet, so just ended up using it on all tops and the board. I think it came out great and class feedback was positive. Because of the nature of imperfections in wood, that was in my favor with detailing out my process and creation. 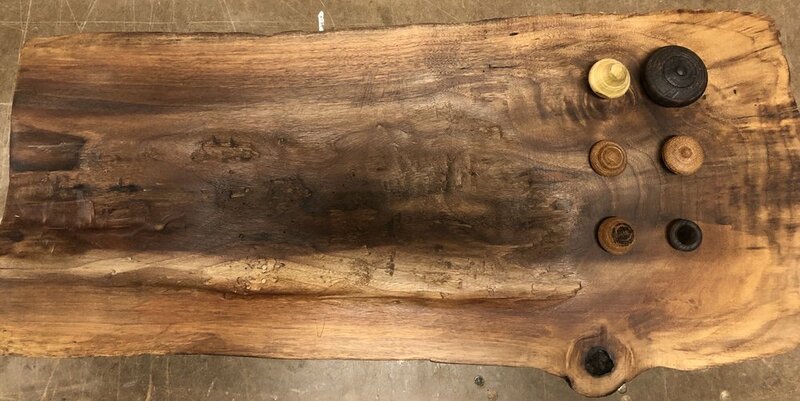 Someone even stated that the tops looked like acorns or other objects that could have easily fallen out of a tree, and some other classmates also commented on how it reminded them of a traditional tea table they grew up with in China. All and all, I’m proud of this one! For these weeks, I used Vectorworks to design this object to then cut on the 4-Axis mill. The machine was not in working order during the week in which this was due, and my schedule has not allowed for a dive into this machine since. I will however try to do this over the spring break — more images below on creation process. This week we used the metal lathe. I think the tool was a bit off when I used it as the there was a bit of metal that would not fully remove just off-center. Regardless of this, I found the metal lathe to be more relaxing than the wood lathe. I started off my project by attempting to smooth out the sides and prep them for a cleaner turn — I had some initial frustrations with the tool not fully smoothing out the bottom, but found a solution in the process (at least for one end). It tips a bit but definitely not bad for my first run! I found that once I got a hang for the movement of the machine, all fell into place. Since we were limited to a ‘top-hat’ - like design I wanted to experiment with several steps and came out with the finalized design. I was aiming for NYC skyline — could easily be an interpretation of the Chrysler Building, but who really knows. 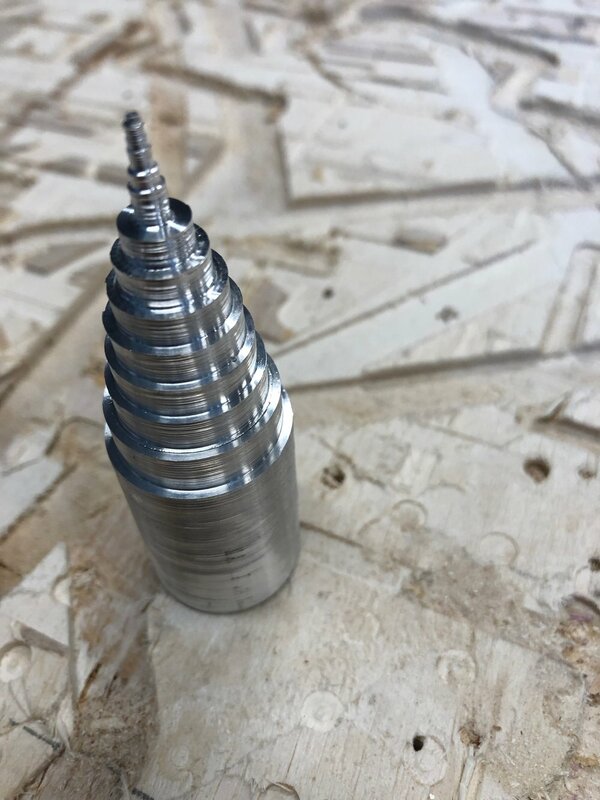 I’m looking forward to experimenting more with the metal lathe in the future with different metals and additional tools. This week, we were assigned a project to turn a mallet on the lathe. This process involves several steps and separate turned pieces in order for it to come together into a finished product. On Monday (2/11), I started out my journey of finding wood by heading up to the Bronx to go to Rosenzweig Lumber & Plywood Corp to see what my options were. I learned quickly after visiting the office that they only sold 8 foot long pieces and didn’t have any scrap wood or smaller pieces. When the puzzled look appeared on my face the kind woman at the desk mentioned that there was a carpentry shop next door and they could potentially cut the wood for me. I hadn’t seen any shops adjacent to the building, but trusted her guidance and entered the unmarked door next to the shop. Here in this warehouse was about a 20,000 square foot shop with every power tool possible to design any furniture piece anyone could ever conceptualize. I quickly found a gentle shop worker by the name of Jorge and asked if he had any scraps around that I could buy off of him. First, he gave me a piece of pine, then some small oak planks, a large plank of poplar, and finally a huge chunk of walnut that looked as if it came from a beam or something — the piece was well-aged and had a rust stain on the side. I ended up walking away with all four pieces for $15. I asked Jorge for a card and found out a bit more about the company, Propylæa, which appears to and now have a contact for future projects that has some amazing talent and pieces to work with. Next, I carried my newly pieces back to the train and was kindly offered a bag by a passer-by in the station. I got back to school and began to shape the handle. I cut about 1.5” x 3” X 10” off of the chunk on the band saw and cut that piece in half and was left with three pieces to work with. I next prepared the lathe and a smaller piece of walnut and began to shape it on the lathe. Right away, I could tell that this piece was going to turn well and was easy to round within just a few minutes. Next, I intuitively shaped a handle and got a gorgeous grain pattern to emerge in the process. I knew I was going to polish the wood with a bees wax and went wit a bit of a honey handle theme on the handle to begin with. After the handle was shaped, I took a look in the scrap bin to create a jig to use to mount the drill to get properly angled pins for when the head was turned. I found a few different pieces of plywood and got them prepped for the lathe. Every time I tried to turn, the piece would break. I tried again with another piece of pine, and still was not right. Alas, after several attempts, I had something I could use and used the drill press to drill appropriately sized holes in the the new ‘tool’ I made for myself. For the pins, I wanted to make them on the lathe as well - I also prepped with some pine I found in the scrap bin and failed to make that piece turn without breaking. I learned in that process that soft woods are really not the best for narrow works — at least with the chisels that I was using to shape them. Post this prep work — that now looking back could easily be a wasted hour — I mounted and rounded the larger piece of walnut that would be used for the head of the mallet. I only had time to turn roughly to an almost perfect rounded dowel and then ran out of time and had to clean up for class. I purchased a tin of Vans Daddy Beeswax for Kitchens & Furniture on Amazon and had that delivered the next day so that I would have it in time to build and finish the mallet on Wednesday. On Wednesday morning (2/13) , I returned to the shop and re-mounted the walnut to shape the head of the hammer. I had a pretty good experience bringing the piece down to almost symmetric and got to the shaping of the edges to match the handle with the bee-theme. In the process of shaping, the wood snapped and I lost the control on the piece to make it the way I envisioned. I decided to change directions, and took the head off the lathe, cut it down, and took it to the sander. I found that using the sander was another opportunity to shape in a different way and saw a hand-cut like pattern begin to appear and just went with it. I tried re-shape the handle the same way, but realized quickly that it wasn’t going to work the same way due to the physics of the piece and didn’t want to completely destroy what I created. Since my idea around drilling the holes for the handle and pins from the lathe was no more, I moved onward to the drill press and placed the holes. I also created pins out of some oak and remaining walnut pieces. I glued all together and polished the mallet with the beeswax and let it dry. I applied another coat and voila, I made a mallet! I really enjoyed this project — regardless of the ups and downs, this was my second piece ever on the lathe, and I thoroughly enjoyed the journey of how this all came together.